We managed to get our hands on a review unit only a couple of days ago and we’ll be doing our typical routine over the following weeks. However, a quick hands-on report was in order, which you can read here. Undoubtedly, the key feature of the Oppo R1x is its striking design. It’s a blocky rectangle with its corners rounded ever so slightly. A metal frame runs along the entire device, chamfered and finely machined. It’s the back that gathers all the jealous stares though, with a triangle pattern that plays tricks with light and mimics sapphire. The Oppo R1x measures 140.6 x 70.1 x 6.8 mm, which is a pretty standard footprint for a 5-inch smartphone, but the 6.8mm thickness sets it apart from the crowd. Weight is 130g and overall the smartphone is compact and won’t feel heavy or bulky in your pocket. The dimensions were enough to fit a 2,420mAh battery, and a powerful 5V/2A charger comes in the box. No VOOC fast charging, sorry. 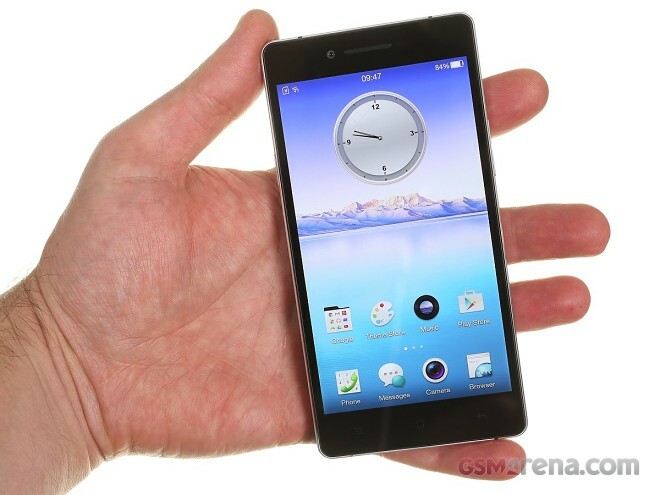 The phone comes with a 5-inch display and resolution is 720p, instead of FullHD. At this diagonal, however, the HD resolution is sufficient and results in a respectable 294ppi density. The screen is bright and also has some very good color stability when viewed from the side. Oppo’s home-brewed ColorOS is in its 2.0.1 iteration on the R1x, but what we don’t like is that it’s based on Android 4.4.4. Hopefully Oppo will address that and provide a Lollipop update in the near future. As is the norm with Chinese manufacturers, the interface is single-tiered – there is no app drawer and all your apps pop up directly on your homescreens. Oppo bundles its own apps for basic tasks such as messaging, email and galleries and they have a simple, consistent look. Menus have a pleasant appearance as well, with an easy-to-the-eye black on white layout. The R1x is powered by the Snapdragon 615 chipset – a popular choice in the mid-range these days. 2GB of RAM should provide effortless multitasking as long as you don’t overdue it. If you find the 16GB of built-in storage limiting, you can slide in a microSD card, but bear in mind that the slot is shared with the second SIM, so you don’t get to have both. If you do go for two SIM cards you get 2G on both in a dual stand-by configuration, while SIM1 additionally supports penta-band 3G and triple-band LTE. There’s the usual set of connectivity options, like Wi-Fi b/g/n, Bluetooth 4.0 and GPS. Memorable occasions get to be documented by a 13MP camera, which sits behind a reasonably fast f2.0 lens. Video recording tops at 1080p/30fps, but there’s a 480p slow motion mode as well. The front camera is a 5MP unit with the same aperture and its video recording is capped at 720p. That’s all for now, but be sure to check back for the full review, which is already in the works.